For five decades Metro Pool Services Limited has been serving homes in the Greater Toronto Area with professional and reliable swimming pool maintenance and repair and renovation services. Our primary services are the spring opening, weekly maintenance, and fall closing of your swimming pool. Restoration and renovation services are available as needed. Our team of pool technicians can supply you with a complete line of quality swimming pool chemicals, parts, equipment, and accessories. Our retail store carries the major brands of pumps, filters, heaters, safety covers and accessories. At Metro Pools, we only carry high quality swimming pool chemicals, parts, accessories and pool equipment. When it comes to pool equipment, supplies and chemicals, quality does make a difference! Inferior chemical products contain fillers and pastes that can clog filters and chlorinators. The most popular items are in inventory, and water testing at our store is always free. Our staff will advise you on safe ways to handle and add chemicals to your pool. Our trucks are in radio contact with each other and our office, allowing our technicians to respond to your calls quickly. One of the most important things we do is show up on time! Our crews are experienced and most have been with Metro Pool Services Limited for many years, including five of our repair and maintenance technicians who have been with us over 20 years. We are proud of our response times and in most instances our regular maintenance customers can expect a service call within 24 hours of requesting a repair call. Firm dates for the spring opening and fall closing of your pool are scheduled in advance and for these services our office will always call the day before to confirm our visit. We care about providing the full service for residential pools and offer free water testing – call us today to schedule your repairs. 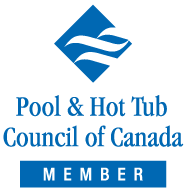 We're a member of the Pool and Hot Tub Council of Canada. As a member we are bound by a strict code of ethics which is an assurance of service, quality, and expertise.